This Friday the Harmony Farms team will be visiting our store for a Meet & Greet! Harmony Farms will be visiting Destination HWY 420 in East Bremerton this Friday for a Meet & Greet. Harmony Farms is a clean and compassionate marijuana producer/processor that is setting the standard for Washington cannabis. Come visit us on 11/30/18 and pick up some Harmony Farms and Indigo Pro products at discounted prices! Harmony Farms produces clean, green, and highly potent marijuana products. They've also recently taken the industry to a new level by partnering with AiroPro to develop vape cartridges with the lowest failure rate in the State of Washington. Every plant from Harmony Farms has been treated with tons of love, care, compassion, and positivity. Every batch of oil has undergone clean extraction methods to ensure any impurities have been removed, which leaves you with a clean, smooth, and highly potent cannabis oil. Harmony Farms produces strain specific oil, and oil with blended terpenes to create incredible flavors such as Blood Orange and Sugar Plum. Each oil filled vape cartridge has it’s own unique flavor and effects. Whether your prefer Indica, Sativa, Hybrid, or CBD, Harmony Farms has something that’s sure to please. From Durban Poison, to Night Rider, and Harlequin, all Harmony Farms products are 20% off all day long on 11/30/18. We look forward to seeing you all this Friday, and the Harmony Farms team is excited to answer any questions you may have. 20% Off All Harmony Farms Products On 11/30/18! Harmony Farms has been in our store for a long time due to their consistency in producing such amazing cannabis products. Harmony Farms partnered with AiroPro to bring the Washington cannabis market one of the most advanced vape cartridge systems available today. AiroPro/Harmony Farms vape cartridges have magnetic connection technologies instead of the standard 510 threading found on most vape cartridges. These cartridges are leak resistant and have high quality ceramic atomizers, designed specifically for vaporizing cannabis oils. We’ve found that many vape cartridges from other companies don’t allow for massively cloudy hits; Harmony Farms vape cartridges are built to give you 3-5 times the amount of vapor when compared to industry standard products. If you haven’t tried one of these vape cartridges, you’re missing out. 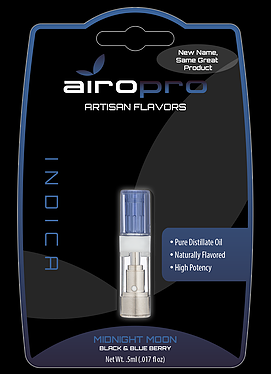 Harmony Farms has partnered with AiroPro to bring the Washington cannabis market one of the most advanced marijuana oil vaporizing devices available. These vape cartridges produces 3-5 times more vapor than most competitors' products. These products are available at Destination HWY 420 in East Bremerton. One of the reasons that Harmony Farms marijuana flower is so good is because they use organic pest management and organic microbes to help with the plant's immune system and general health. Harmony Farms flower is available at Destination HWY 420 in East Bremerton. One thing that separates Harmony Farms from a lot of other cannabis companies in Washington State, is that they not only practice good growing methods, but they understand exactly why they do what they do. Their level of knowledge into plant biology is key to their success into producing some of Washington’s best cannabis products. Harmony Farms uses organic pest management, and they enrich their soil with organic microbes, which help with the plant’s immune system, nutrient breakdown, and overall general health. Harmony Farms grows each strain in a separate room to ensure that the individual qualities of each plant are allowed to properly develop. From Holy Grail to LA Cheese and Zensation, Harmony Farms has a cannabis cultivar appropriate for every type of cannabis connoisseur. Harmony Farms has a wide range of time proven, potent, and exotic cannabis cultivar to include strains such as Blue Dream, AK-47, Lavender Trainwreck, Pineapple Express, Sour Diesel, Sunset Sherbert, and More. [As both company and people we promote a future filled with harmony. Our highly experienced team has been farming together since March, 2015. It is our sincere commitment to build a reputation of excellence and transparency that supports the greater cannabis community. We take pride in bringing you the best we can offer and look very much forward to growing together. Thank you for your support on behalf of all of us here at Harmony Farms. Destination HWY 420 is a recreational and medical marijuana retailer located in East Bremerton, WA. Medical marijuana consultants on staff, medical compliant high THC and high CBD products available. Large selection of marijuana flower, prerolled joints, edibles, drinkables, topicals, vape cartridges, concentrates, and more. Lots of high quality RSO available for around $30/g. Follow us on social media to be the first to hear about cannabis industry events, deals & sales, exclusive media content, and more. We hope to see you all at this upcoming vendor day! If there are any questions you'd like for us to ask Harmony Farms in our video interview, let us know in the comments. If you've tried Harmony Farms products, we'ed love to hear your feedback on how much you liked them.